One of the surprising things we learned about Stephen Sondheim in his two-volume examination of his lyrics (Finishing the Hat and Look, I Made a Hat) is that the guy’s not a fan of meta-musicals. 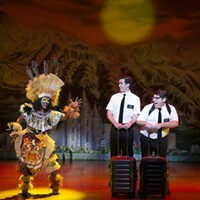 These are a relatively new breed of show that comments on itself as well on musicals in general — think Drowsy Chaperone, Urinetown, [title of show] and Bat Boy. Sondheim believes such work ridicules and diminishes the art form. Far be it from me to contradict His Holiness, but I think meta-musicals can be created only by people who love musical theater. 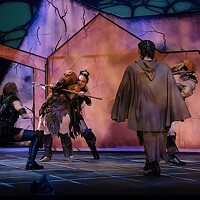 Take, for example, the latest show at Theatre Factory — The Musical of Musicals: The Musical. Its two acts are made up of five skits, each parodying the work of different legends: Rodgers & Hammerstein, Sondheim, Jerry Herman, Andrew Lloyd Webber and Kander & Ebb. Composer Eric Rockwell and lyricist Joanne Bogart (both of whom contributed the book) are very aware of musical theater’s sometimes silly plots, cardboard characters and ridiculous resolutions. They gleefully lampoon those elements, but at the same time salute them. This show could have been written only by people who’ve spent their entire lives immersed in musical theater. It’s also true, however, that if you’ve passed your time in less neurotic pursuits, a lot of Musical of Musicals will probably pass you by. The show’s a treasure trove of inside jokes. How many musical-comedy insiders remain, however, is another matter. Directing this Theatre Factory production, Nick Mitchell’s assembled a fun cast with terrific voices; Alexander Slaughter, Brittany Tague, Jeremy Kuharcik and Kathy Hawk. Everyone’s having a good time, and I especially enjoyed the manner in which they adapted their playing style to suit the particular world of each composer. The pace is considerably slower than it should be, which kills some of the jokes, and the physical production is woefully threadbare. I know sets and costumes cost money, but this is one musical that demands that ol’ razzle-dazzle. After all, that’s what show biz is all about.